Please check out our new website at AFBCASH.EU!!! AFBSport Sponsored Team "Climax" has entered the Grand Finals in MSI Grand League - League of Legends. 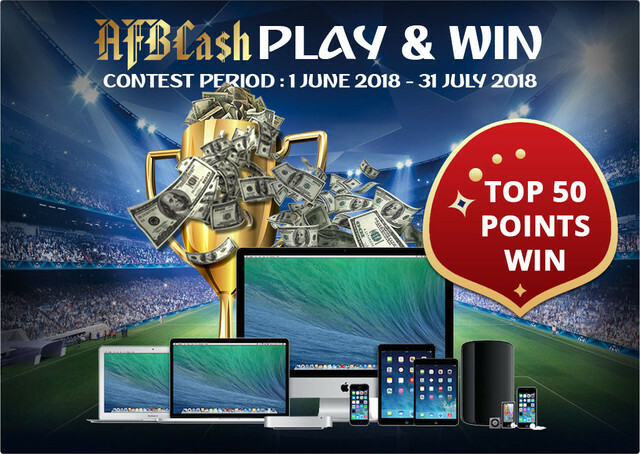 AFBCash Daily World Cup 2018 Pro Picks with very high accuracy winnings and large payouts since Day 1 of the Russia 2018 World Cup matches. AFBCash players are confidently increasing their bet amounts in sportsbook for the daily World Cup 2018 matches by using our own AFBCash Pro Picks as professional football tip predictions. To top of our ridiculous promotions. Now everyone can WIN! Check out our daily leaderboards update to see if you are listed. Don't miss out this remarkable DRAW PRIX! afb-esports.com memberikan event turnamen Esports Indonesia yang terbaik dan memiliki hadiah yang sangat besar dan juga tidak dipungut biaya. Hal ini sebagai dukungan terhadap dunia Esports di Indonesia. Deposit now for chance to get invited to FUTURE AFB Parties in 2018! Missed our latest #AFBYearEndParty feat. International DJ SODA from Korea? Register and deposit now for get a chance to be invited for future #AFBParties that are even bigger and better than ever! AFB Year End Party featuring DJ SODA was a highly sought after party event! By popular demand, we are now planning for more AFB Parties and AFB Events, including special tickets for our members throughout year of 2018. [Register now] with daily promotions for a chance to attend the 2018 AFB Parties! AFB sponsorship for Borneo Martial Arts Expo and Sport Kickboxing a success! The Borneo Martial Arts Expo and kickboxing championship was a success. The international event garnered press and media coverage from around asia. Positive news about the new interest in martial arts as a sport in both offline and online press and media shows great potential for growth in this sport in 2018. Local television news covered the events as well. AFB at Borneo Martial Arts Expo and Malaysia K1 Sport Kick Boxing Championship! The Borneo Martial Arts Expo and Malaysian K1 Sport Kick Boxing Championship saw an attendance of various martial arts groups and teams. Different practices and martial arts group performed, shared experiences, and exhibited their different styles here to promote Martial Arts as a sport. AFB will be participating in the martial arts world in a big way in 2018. To start it off, AFB is the platinum sponsor for the Borneo Martial Arts Expo & International Sport Kickboxing Association K1 Malaysia Championship happening in Labuan on the 29th Dec 2017, ending with a Countdown party on 31st Dec 2017. Nurturing the talents and supporting a high skilled sport such as kick boxing allows AFB to bring this sport to the masses and help to promote Kick Boxing as a healthy skill-based sport. Register now for chance to get invite to meet DJSODA from Korea at #AFBYearEndParty! Register Now and get a chance to be invited to the AFBYearEndParty! AFBSport will be Celebrating the challenges, trials, participations in international races and achievements of 2017. The AFB 2017 Year End Party will be held during Christmas weekend in KL. The party will feature International DJ SODA and many more entertainment and games. Make sure you don't miss the invite! After grueling 2 rounds of slippery and wet track. We have concluded a difficult 2 day of #MSBKRound5. Although finishing the day with DNF this weekend, the exhausted AFB Sport crew, team, riders and even the bikes themselves have gained valuable experience with extremely wet race conditions at the notorious Sepang International Circuit. Congratulations to AFB Sport and team and riders for making it through this challenging weekend of 25-26 Nov.
AFB Sport division of AFBCash is preparing for the Final Round of the Pirelli 2017 Malaysia Superbike Championships. We will be taking part in the final round with 2 riders representing the AFB Sport Team. Follow our progress and race results this weekend 25-26 Nov at the Sepang International Circuit. Get Invited to our AFB 2017 Year End Party! We are hosting a Grand 2017 year end party! Get a chance to be invited to our VIP party! We got our hands on the latest build of the brand new AFB Poker! Testing it out in the office. We keep missing our turn because of the beautiful dealer here on our test table. Ask our friendly customer service for more information! AFBCash would like to congratulate our AFB Sport team and riders for winning the First and Third place podium finish at Taiwan Superbike Championship Round 3. The race was held at the Penbay International Circuit, Taiwan this weekend from Friday 3rd November 2017 to Sunday 5th November 2017. AFB Sport Rider Podium Finish at Taiwan Superbike Championship Round 3 (5th November 2017). New AFB Poker Coming Soon! AFBCash.com is proud to announce that a brand new Poker is coming to town very soon! The new AFB Poker is created using the latest HTML5 technology that makes gameplay smooth, stable and entertaining on any smartphone, tablet or even laptop. Ask our friendly customer service to notify you once it’s available! AFBCash today announced our brand new ambassadors, one of the leading suppliers of online gaming products to an international market. We offer a wide range of First-Class Products in a safe and user-friendly gaming environment such as sports-betting, live casino, slots, card games, number games, forex and poker. We take pride in being the last website you will ever need! Our AFB Sport team is now deep in the preparation process for the 2017 Pirelli Malaysia Superbike Championships (MSBK) Round 5. We are now exactly 40 days away from the race scheduled to begin on the weekend of 24th November 2017. We are learning from our past experience from the recent Round 4 race and also Taiwan Speed Festival to better not just our rider, but also our bike, the crew and support team as well. Additionally, we will also be preparing for coverage of the event on facebook by our AFB Sport team, as well as our line up of Race queens. Our AFB Sport team was out in full force at the recent 2017 Pirelli Malaysia Superbike Championships (MSBK) Round 4. The round started with a minor slip to our rider during the practice round on Friday Sep 15th which cost us the rest of the practice day. We were however able to participate in qualifyings and completed successfully during the weekend of extremely hot weathered racing. Additionally, we have also garnered the attention of the media as well as spectators from our live coverage on facebook by our AFB Sport team, as well as our line up of Race queens. AFB Cash participation in Pirelli Malaysia Superbike Championship 2017 Round 3. (29th to 30th July, 2017) Team rider #16 Joey Teo took part in Super Sport category. In Race 1 we face a major technical issue whereby the spark cables was burnt out and forced to return to pit without completing the Race 1. Special thanks to our dedicated technical crew En. Hafiz and sport partner SRT team supporting us and we managed to fix it the same day to get ready for next day Race 2. Fortunately, Race 2 we did well and managed to cross the finishing line at 5th placing. Special thanks to our team riders, filming crews, sponsors, Taiwan motor sport partners and friends for their supports. This clip is dedicated to you guys and thank you for the wonderful experience.Taiwan Speed Festival.